Editors’ note: Prohibition, the documentary by Ken Burns and Lynn Novick, concluded last night. We’re very pleased to bring Points readers a review of the third episode from historian Jason Lantzer (more on Jason here at the Guest Bloggers page). Readers may also wish to check out David Fahey on Episode One and Episode Two, and Frankie Bailey on Episode Two. By the time viewers reach episode three of Ken Burns and Lynn Novick’s Prohibition, they have been transported from the early nineteenth century when temperance was but a dream for a nation awash in drink, to the mid-1920s when Prohibition was in place. The theme is “a nation of hypocrites,” detailing how the United States wrestled with the “noble experiment” and ultimately decided to put it to an end. 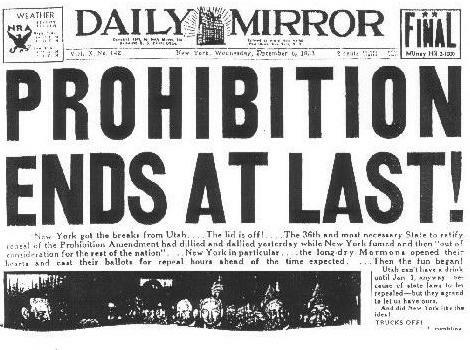 And befitting a conclusion, the episode draws many parallels with the Age of Prohibition and our present one. Whether that is enough for viewers is another question entirely. Viewers are shown how immigrants reacted to the law, the excitement of speakeasy culture, the gangsters who helped make it possible, the politicians who fought over it, and the dry and wet forces that battled for and against the Eighteenth Amendment. Those showcased are Lois Long (writer for The New Yorker, who glamorized breaking the law by drinking for a generation of readers), Al Capone (famed gangster whose rise was facilitated by Prohibition), Al Smith (wet New York politician and 1928 Democratic Party presidential nominee), Mabel Willebrandt (assistant US attorney general, who helped unleash dry religious and legal forces on Smith’s candidacy), and Pauline Sabin (wealthy Republican socialite who went from supporter of the dry cause to one of its harshest critics and champion of its repeal). Others who garner some mention in passing are Fiorello LaGuardia (New York Republican Congressman, who consistently asserted his belief in the absurdity of Prohibition), Bishop James Cannon (leading Southern dry who took Wayne Wheeler’s place as the spokesman of the Anti-Saloon League), and presidents Herbert Hoover and Franklin Roosevelt (who jointly presided over the last days and death of the noble crusade). With the cast of characters set, Burns and company begin to explore the decline and repeal of Prohibition, as well as the lingering affects it continues to have, ranging from worries about morality based legislation and proposed Constitutional amendments, the vast difference in drinking today as opposed to pre-Prohibition, as well as the formation of Alcoholics Anonymous. As with any Burns miniseries, the viewer gets the full treatment. Hollywood actors provide the voices for the narration. Historians and experts are utilized to great effect. Period photographs and music dominate the screen. It is well packaged and delivered, and a pleasure to watch. But that does not mean there is not room to offer a critique. For starters, the episode feels rushed. Perhaps it was simply a desire for more on the part of this reviewer, and yet it seemed as though there was, and is, plenty of material to have crafted a fourth episode by expanding on the material covered at the end of episode two and the start of episode three, as well as developing repeal itself. And that is something that should have been given more attention. Here is what we have been building towards, and yet the complexity of ending the Eighteenth Amendment is short changed, because to wets at the time (who wished it to be so) and to us today (who live in a post-Prohibition world) it seems inevitable. And yet, wets and the Roosevelt administration invested a good deal of political time, talent, and treasure to making sure repeal happened. Focusing on a state level battle might have been instructive. For example, in Indiana, wets left little to chance. Governor Paul McNutt worked with the Roosevelt administration to both plan the repeal vote (timed to dampen dry rural voters), and build support for the measure, both as a cure for the Depression (a fact that Burns and Novick do touch on) and via the threat of higher taxes if the Eighteenth Amendment is not repealed. Digging a bit deeper might also have produced more conversation on the complex role of religion and para-church organizations (such as the ASL and the WCTU). Not all drys were evangelical Protestants. There were Catholics who supported the dry cause and those relationships were cultivated. Discussing the role of dry Catholics, and indeed their struggle within both their church and (often) immigrant communities would have provided more nuance. More also could have been made out of the aging leadership of groups like the ASL; indeed perhaps this is why drys were so reluctant to compromise, or unable to affectively counter the wets in the end. It might also have raised important questions about what evangelical Protestantism was, is, and would soon become, as well as the role of denominations in politics. Another area that could have been explored more was that of the international dry crusade. Indeed, there was virtually no mention of Prohibition’s international context throughout the series, including the World League Against Alcoholism. The rise and fall of the international dry crusade would have offered some crucial context and perspective to what was occurring in the United States both before and during repeal. A further critique is that the final episode focuses too much on New York and Chicago. This is a trap that befalls many commentators. In part, it is only natural. The sources and stories from these metropolitan areas are so rich and riveting. And yet, neither New York nor Chicago is all that representative of the nation at the time. To many urban dwellers, as the episode correctly points out, Prohibition was a vast mistake (indeed, this is largely the theme of Daniel Okrent’s companion book). But to many Americans, both in the cities and in the countryside, the dry cause made perfect sense. Their voice is largely lost in the third episode. So, does Prohibition succeed? As someone who has spent time researching and writing about the dry cause, anything that draws attention to the topic, especially something on the national stage of a Ken Burns feature for PBS is a good thing. While far from comprehensive, and like any documentary series (or book for that matter) having its flaws, ultimately it is a nice place to being a discussion about both the past and the present. Next Post → Washington State’s Proposition 1183: Consumer Convenience or Culture and History? Just want to agree with Jason Lantzer about the missing international dimension. (A good friend, the late Frank Merli, pointed out to me the same neglect in the great Burns-Novick series on the American Civil War.) The myth of American exceptionalism can make the best of us stumble. Jason, thanks for this thoughtful set of responses. Your point about New York and Chicago is well taken. To some extent, the “fade out” of rural and small town America reflects the sense of inevitably that underlies the film’s treatment of both Prohibition and repeal. To be sure, the film does highlight the political nature of the contest. Still, it isn’t hard for the viewer to understand Prohibition as the inevitable (if misguided) response to “A Nation of Drunkards” when the focus is so close on temperance and prohibition activism, and to understand repeal as the inevitable (and welcome) response to “A Nation of Hypocrites” when the focus is so close on the geographic centers of the wets’ resistance. Through this lens, the whole episode becomes oddly irrelevant for contemporary students of policy, and it shouldn’t be. I have not finished watching episode three. However, I find the over-all message of the three episodes rather confused. Did I fall asleep and miss the film reporting that Prohibition was part of a larger movement to change the way capital was invested? And would someone tape the mouth of anyone who says “you cannot legislate morality” when we legislate morality in all sorts of ways? Watching all three episodes of this excellent series, and reading the important and very interesting critique posted on Points, I would like to add my own 50 cents, If I may. Much has been said about the series obvious simplification of the century which led to the 18th amendment, and it was all true. It is also true that the limits of a 2-hour documentary are … errr … limiting. No movie will ever be long enough to present all the nuances and all the complicated details of any phenomenon – and that’s ok. I thought the most positive thing about the first episode was that it had a little something for everybody: Women, immigrants, the rise of wedge-politics, industrialism, etc. – most of the topics that appear in most narratives about the coming about of the 18th amendment and the Volstead act, were there – shortened, truncated,over-simplified – maybe … but they were there. all ties connected, prohibition in the documentary was really the embodiment of modernization. Although not mentioned and probably not intentioned, the connection made by David Courtwrigh between drugs and modernization was made clear by Ken Burns. This brings me to my own problem with the series, which is the complete absence of opium, cocaine and marijuana the series. If, as Dr. Lantzer pointed out in this blog, the international aspect of the temperence cause was only briefly mentioned, the successful international campaign against opium was completely ignored. The connection between the failures of the alcohol prohibition and the failure of the contemporary drug prohibition regime is all too clear, I only wish it would been pointed out a little bit more clearly.